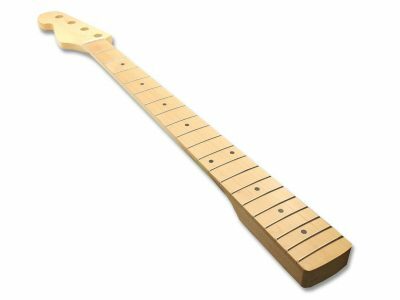 I ordered the maple strat neck (in addition to a Tele kit). When it showed up it had a few flaws around the inlays and the side dots. I brought up my concerns to Matt. He quickly issued a postage-paid return slip, personally inspected a replacement neck, and shipped it out immediately. It got here the next day and it looks great! Matt was correct these necks are a little thicker leaving you with room to shape it down if you desire. I like a “Baseball Bat” size neck so this was excellent. For me it could be just a little bigger but that’s me, I have huge hands. The frets are very well finished and beveled. The edges of the fret board is very well rolled. The fret ends could be smother for some but I have played it for more than 30 hours just as I picked it up and my hands are very happy. There is ZERO fret buzz across the neck and they are perfectly crowned. It is a large “C” shape but deep more like a “U” shape of the late 60’s Fenders. Mine is 13/16 th thick at first fret, 7/8 at the 12 th . The alignment with the bridge leaves almost an 1/8th of a inch from edge to the string on both E’s from nut to the 21 first fret, perfection. If you can go to the store !!! Go the staff is amazing. I wanted to also say more about the frets for others considering one of these necks. The fret height and width is just right. If I ordered fret wire from StuMac to replace these they would class these as a (“medium-jumbo-wide”). They are truly just right, larger than vintage, and I feel just a touch bigger than a 2017 Fender MIM or USA strat. These will handle leveling and re-crowning many, many times. I play so hard that normally I re-crown my guitars every 6-10 gigs so I got about 2 years on these which is way better than on a Fender. For most players these will last you years to a life time of playing. “Southern Peach” this year with my SOLO guitars. The neck is installed and I must say it is INSANELY amazing, zero fret buzz and not touch ups. I can’t put the guitar down it just to good !! !